Our Motto is "Your Pet Can Never Have Enough Bling"
Jeweleash was founded in 2014 to provide the most discerning pet owners with a first quality option for their family members that are small dogs. The line consists of harnesses and leashes that are made of the finest materials available. 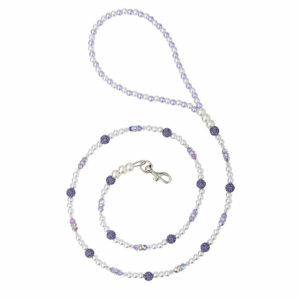 The leashes feature genuine Swarovski crystals and fine Japanese costume pearls. While the harnesses are made using colorful and comfortable micro suede materials that feature a proprietary itch free Velcro design. We welcome you to invite your pet to experience this luxury line of pet products that will make them the talk of the town.